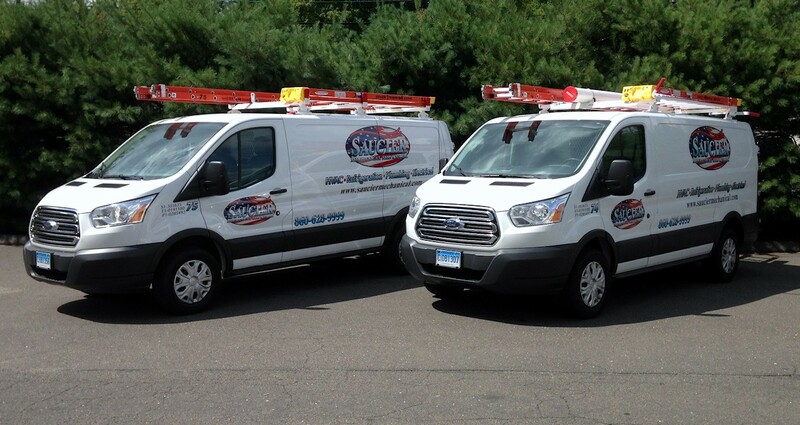 Saucier Mechanical Services has been serving Connecticut since 1991. We are the area’s premier commercial and residential heating and cooling company. We also provide sheet metal fabrication and installation as well as plumbing and electrical services. Whether you own a commercial building or a home, whether you need installation or service, our goal is to be there when you need us and take care of your problem quickly and professionally. Our facilities and EHS staff watched the Saucier technicians from the shadows during our major RTU installations, and we were thoroughly impressed with their adherence to security and safety protocols and completed the installation with a high degree of professionalism and attention to detail. We’re pleased to have chosen Saucier for our important renovation project. Saucier did an excellent job in upgrading our electrical panel, installing all the necessary replacement GFCI interior and exterior power outlets and wiring for our security and landscape lighting, barn and gallery, bringing all electrical elements up to code requirements for service integrity and safety. We are extremely happy with the installation of our new A/C unit! First time using Saucier and we will definitely use their services in the future. We will highly recommend Saucier Mechanical to our friends and family! — Brian & Tracey D.
Home heating systems: boilers, furnaces, heat pumps, and radiant heating. Air conditioning installations, service and repairs. Plumbing, repairs, new installations or retrofits. Electrical installations, service and repairs. We service, maintain and replace all types of commercial HVAC systems including oil and gas boilers, steam systems, chillers, rooftop equipment and split system air conditioning systems and commercial refrigeration. We also provide full commercial electrical and plumbing services.